There are still a couple of prime driving months ahead and your region offers several opportunities to make good on your goal to "get more seat time in the Porsche this year." 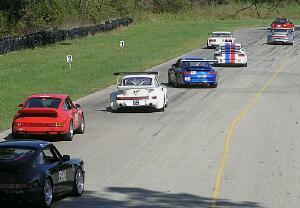 Coming up in the near term are two casual driving events and the season close-out to the Autocross schedule. There's also a concours d'elegance and car show to wrap up the month of October at International Auto's new Porsche store in Waukesha. Porsche sales decline in August. 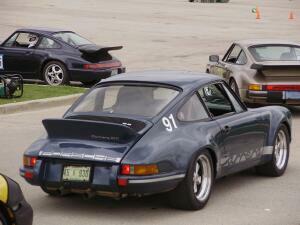 Details on the final autocross event for the season, and much more. This is a half-day tour, starting in Jackson, Wis., at the McDonald's on Hwys. 45 & 60. A point of interest on this tour will come toward the end of the drive when we visit We Energies' wind farm in Fond du Lac county. Tour a wind turbine, one of 88 that is part of this renewable energy site. Lunch at MJ Stevens near Allenton, which is optional, will conclude the tour. Full details available here. Autocross is a low-speed driving event that tests your ability to traverse a course marked with cones in the East parking lot at Miller Park. Special equipment is not required, except for a helmet, which you may be able to borrow at the course. Details are available here. This is a very short but colorful and interesting driving tour. Drive just long enough to work up an appetite and then enjoy breakfast with other members at Andrews in the Delafield Hotel. Everyone orders from the menu. To provide the restaurant with an estimated headcount, however, please RSVP if you plan to join us for this combination driving/social event. Details here. 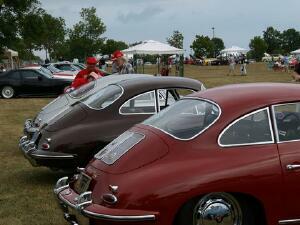 Whether you clean like a fanatic or just keep your car looking good, come on out to the region's final concours d'elegance and car show on Sunday, Oct. 26, at International Auto's new Porsche store in Waukesha. Details here for entrants and spectators alike. Due to the change in publication from a print newsletter to our online news format, we regret that we neglected to recognize the anniversaries for April, May, June and July, as well as welcome new and transferred members for those months. Our apologies. The August anniversaries were listed in the August online newsletter. The current month's anniversaries also are always available in the special members only section of the Region Web site found in the Resources pull-down menu. Fox Valley region member Al Taylor took us up on our offer to get a Taste of the Track this year. Read what this member gained from the opportunity to drive the track in a drivers education setting. Read the exciting news reported by Jim Del Balso on how well Porsche performed in the midst of many outstanding cars of all makes and models on Club Day at the 2008 Masterpiece Showcase. Also note the results of our own region's concours d' elegance competition, including a trophy finish for first-time entrant Chuck Hayes. Way to go Chuck and congratulations to all of the competitors. Board meeting -- Oct. 2. 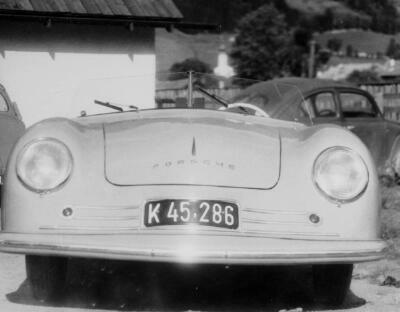 Join board members and others for the meeting and then hang around for informal conversation on the topic of what else, Porsche. All are welcome. The meetings are held at Brew City Barbecue in Mequon. Details here. Parade 2010 planning - A meeting will be held on Sept. 27 at Pheasant Run, St. Charles, Ill., the site for the 2010 Porsche Parade. The meeting is open to all who are interested in learning more about the plans for this nationally run Parade in 2010. The meeting will start at 10 a.m. Directions to the resort are available here. Questions should be addressed to Zone 13 Rep Chris Inglot, 847-559-1126. Several new classifieds were added to the Web site in August. Check them out. The site also provides information on you can submit an ad for an item you want to buy or sell. Need to get in touch with a member of the board or a committee chair? You can always find the region leaders in the Resources section of the Web site. Want to read the minutes of the previous board meeting? Minutes can be requested by contacting the Region Secretary. Need gear, club gear that is? Quality wearables and items are available through our Region merchandise shop. Add some cool-weather items to your closet now. Want to see your car on our Web site? Members are invited to submit .jpgs of their car and the webmaster will load them to the site. The images on the front page of this Web site randomly change each time the page is refreshed. I'd love to have more members' cars than generic images. 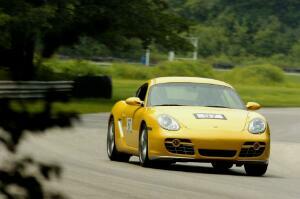 Thanks to Gary Haas for this great action shot of his Cayman S on track during a driver education event at Blackhawk. Send your photo to the webmaster at beverly.jurkowski@sbcglobal.net. The Members only section of this site found in the Resources drop down is password protected. It ccontains this month's anniversary listing as well as a membership directory of the names of members, along with an e-mail address (if the member supplied that in their membership record with PCA). To access this section, send an e-mail to the webmaster with your name and membership number. The password will be sent to you. PCA podcasts provide opportunities to learn from experienced members. Have you checked out the PCA Web site to listen to podcasts (audio files) on topics such as Tech Q&A, Winterizing your Porsche and The Art of Autocross. Check them out today. You'll find the podcast files at the bottom of the home page of PCA.org. Porsche has announced a significant upgrade to its Certified Pre-Owned (CPO) program that will now include an enhanced warranty for all CPO cars sold in the United States and Canada. Since Aug. 1, customers who purchase a Certified Pre-Owned Porsche will receive a company backed 2-year or 50,000m / 80,000km (whichever comes first) limited warranty that mirrors the new car limited warranty coverage. Additionally, for customers who buy cars with a balance of the New Car Limited Warranty Coverage, this remaining balance will be added to the new Certified Pre-owned Limited Warranty coverage. Customers will only be responsible for normal wear and tear components such as brake pads, wiper blades and regularly scheduled maintenance. Twenty-four hour roadside assistance is also included in the pre-owned package. Harvey said the CPO program at Porsche, which is now five years old, is growing in success each year, and this year he expects record results. 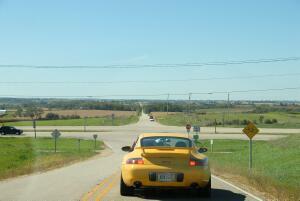 North American Porsche dealers sold a total of 6,985 units in calendar year 2007. Sales are on pace for over 7,500 units in calendar year 2008. In the last five years, Porsche Dealer pre-owned sales penetration has grown from 16 percent of the total Porsche Pre-owned market to 33 percent. This is largely due to the on top sales volume the Certified Pre-owned Program has created for the dealer network. Only the best used Porsches are selected as Certified Pre-Owned Porsches. Every certified used car undergoes a rigorous 111-point inspection and a detailed reconditioning process by Porsche–trained technicians whose goal is to bring the car back to new as close as possible. Feedback -- what else can your region Web site provide to you in terms of information or interaction? Your feedback, photos, articles and comments are always welcome. Contact your region Webmaster via e-mail, beverly.jurkowski@sbcglobal.net.